Have the Steelers 2016 championship chances gone up in smoke? Have the Pittsburgh Steelers 2016 Championship Chances Gone Up in Smoke? Have the Steelers 2016 Super Bowl hopes gone up in smoke? Who really knows at this point? The news that Le’Veon Bell is facing a 4 game suspension for missing a mandatory drug test offers little encouragement. Now factor in Martavis Bryant’s season-long suspension. No matter how you slice it, the Steelers offense just saw their octane rating drop. Yes, the Steelers still have Ben Roethlisberger and Antonio Brown. Markus Wheaton is arguably underrated. Darrius Heyward-Bey remains a viable number 3 wide receiver and Sammie Coates impressed in the playoffs. But the Steelers will also miss Heath Miller, and Heath Miller who gave Roethlisberger as close to an automatic catch as you can have in the NFL. 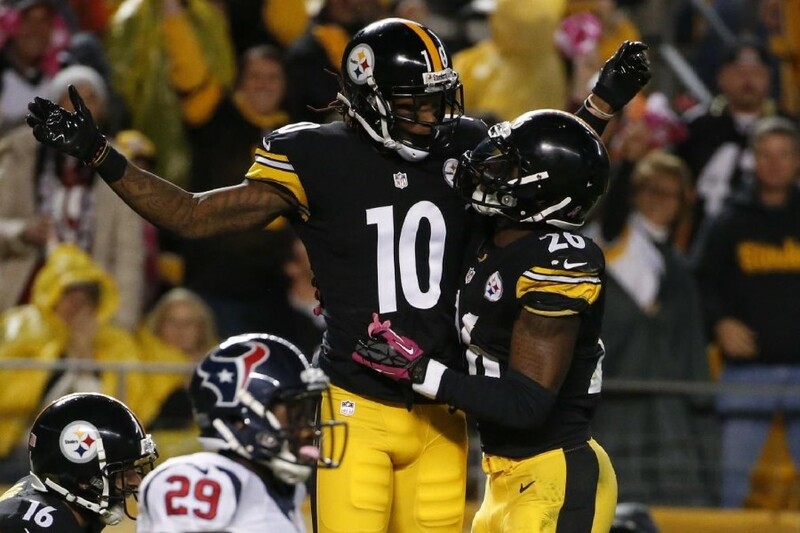 While Bryant only played 11 games and Bell only 6, together the two scored 24% of the 2015 Steelers touchdowns. Of course during 2013 Jerricho Cotchery made a disproportionate share of the Steelers touchdown receptions, but the 2014 Steelers offense more than made up for the loss – in no small part due to the emergence of both Bell and Bryant. The Steelers depth chart at wide receiver is much better positioned to weather the loss of Bryant than the Steelers depth chart at running back. As noted here before the Steelers depth at running back is close to non-existent. Behind Bell, the Steelers only have DeAngelo Williams and Fitzgerald Toussaint. Currently holding roster spots are Daryl Richardson (167-690 rushing, 38-284 receiving for the Rams in 2012-13), first-year man Cameron Stingily and undrafted rookie free agents Brandon Brown-Dukes and Brandon Johnson. One of these 4 men could blossom into the next Isaac Redman or even the next Willie Parker. If they are, they’ll from yet another feather in Kevin Colbert’s uncanny cap of undrafted free agent steals. But remember, Redman didn’t play a down his rookie year and Willie Parker only rushed 32 times as a rookie. DeAngelo Williams performed tremendously in 2015. Credit Colbert for another masterful free agent signing. But Williams will be 33 and skill-position players at that age often suffer sharp season-to-season drop offs. Jerome Bettis was 33 when he retired, although Williams has less than half the carries on his frame than Bettis did. The Pittsburgh Steelers 2016 Super Bowl hopes can in no way be considered bolstered absent Martavis Bryant and without the services of Le’Veon Bell for the first quarter season. Martavis Bryant possesses Randy Moss-like talent, while a healthy Le’Veon Bell is the NFL’s best running back not named Adrian Peterson. However Steelers Nation need not abandon all hope. Last year, absent Antonio Brown, Bell, Williams and Maurkice Pouncey and with Ben Roethlisberger at less than 100% the Pittsburgh Steelers were a fumble and a third and long stop away from the AFC Championship. “AFC Championship” functions as the operative word in the preceding sentence. It is unlikely that the defense in general or more specifically the 2015 Steelers accidental secondary could have gone into Foxborough and beaten Tom Brady. Prior to Bell’s suspension (or Bryant’s for that matter), the Steelers 2016 Super Bowl hopes hinged on Keith Butler’s ability to take Pittsburgh’s defense to the next level. And for that to happen, Butler and Carnell Lake must successfully see Senquez Golson, Artie Burns, Sean Davis and perhaps Doran Grant through a baptism of fire. Don’t expect much proof that that has occurred in September, when the Steelers will be without Bell’s services. At the end of the day, the continued development of the Steelers defense and the performance of their untested secondary will impact the Steelers 2016 Super Bowl hopes more than Le’Veon Bell’s looming 4 game suspension or Martavis Bryant’s year-long disciplinary hiatus. This entry was posted in Steelers 2016 off season and tagged Antonio Brown, Artie Burns, Ben Roethlisberger, Carnell Lake, Darrius Heyward-Bey, DeAngelo Williams, Fitzgerald Toussaint, Heath Miller, Isaac Redman, Jerome Bettis, Keith Butler, Kevin Colbert, Le'Veon Bell, Markus Wheaton, Martavis Bryant, Maurkice Pouncey, Pittsburgh Steelers, Sean Davis, Senquez Golson, Willie Parker. Bookmark the permalink.